Escape and get drenched to a classic seaside amusement park located along a beautiful sandy beach in a friendly beach town. Santa Cruz is one of the best seaside parks in the United States. The park blends the old and the new seamlessly, providing countless smiles for the whole family. With many scream-inducing thrill rides, gentle kiddie rides, casual restaurants, gift shops, games, indoor arcades, and miniature golf. The Boardwalk features more than 34 rides and attractions including two National Historic Landmarks: the world-famous 1924 Giant Dipper wooden roller coaster and the beautiful 1911 Looff Carousel. Click here to learn more about the Endless Summer Season Pass. 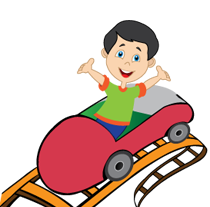 Boardwalk Super Savings Coupon Sheet- Over $100 of savings on RIDES, GAMES, and SOUVENIRS! Click here to print the coupon sheet.